There are some days when you are so busy you subsist on just Twizzlers and coffee. There are some days when you cook a simple meal and revel in your burgeoning culinary skills. And there are some days when only decadence will do. When hedonism calls, Menton answers. Named for a small French village near the Italian border, Menton resides on Congress Street in Fort Point, and is Barbara Lynch’s newest restaurant. Lynch, an incredibly prolific figure in the food world (responsible for No. 9 Park, Drink, Sportello, The Butcher Shop, and B&G Oysters), has entrusted Menton to head chef Colin Lynch, and after my recent visit I can easily say he did her proud. 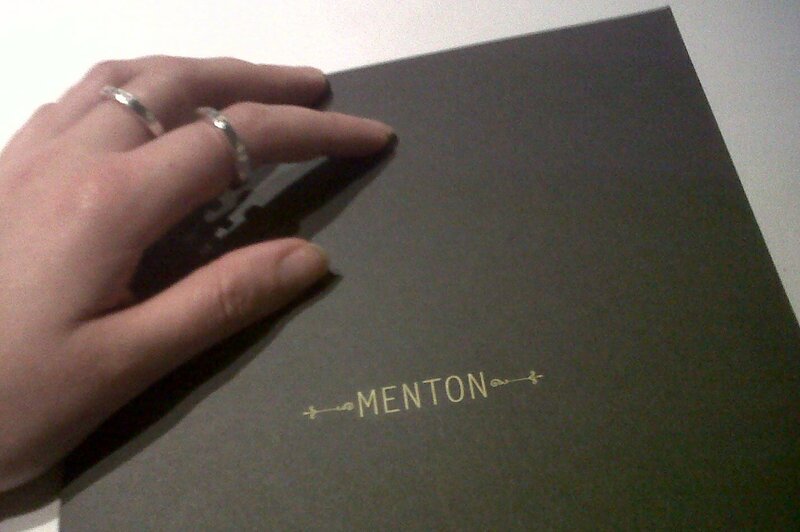 One has two options at Menton: a four course Prix Fixe or a seven course Chef’s Tasting. While I’m sure the Chef’s Tasting is unparalleled, the prix fixe meal that we had actually turned out to be six courses- I couldn’t imagine stuffing one more bite into my mouth. It was one of those marathon meals, when you slowly drink wine and talk about everything and nothing, and periodically look up to a bevy of handsome wait staff, holding plates and silverware and curved pitchers full of sauce, who then, in unison, serve you. And how, you might ask, does one start such a meal? With butter soup, of course. The chef’s gift (not on the menu) of butter soup with poached lobster and caviar topped with honey foam now ranks as One of the Best Things I’ve Ever Eaten. 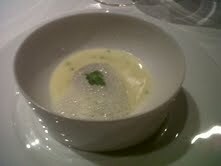 It had a flavor similar to, but not as strong as a béarnaise sauce, with a much lighter texture. The addition of lobster and caviar was completely over the top, but certainly welcome. 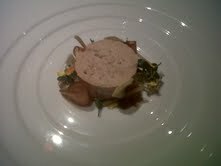 Next, I chose Torchon of Foie Gras de Canard with ginger, monbazillac gelée, and compressed plums. There was a moment, about half way through, when I thought: I should have gotten something lighter- the Shetland Salmon Chaud-Froid sitting across from me was probably the wiser choice to start this meal. But I got over it. Topped with sea salt and served with house-made brioche, the foie gras was smooth, indulgent, and nicely complemented by the ginger. 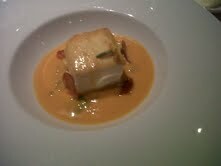 My next course, Chorizo Poached East Coast Halibut with yellow tomato velouté, cucumber and squash, was equally as impressive. The fish was cooked perfectly, but the real star was the veloute, which had such a depth of flavor it didn’t need any accompaniment. The chorizo was paper thin and had a smokiness that played well with the halibut. I have to admit I felt a bit smug over my choice for this course- the Sea Bream, while good, was nowhere near as exceptional. 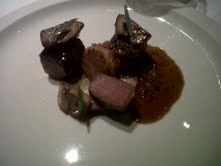 Next was PT Farm’s Ribeye of Beef with sunchoke rösti, porcini, and sauce périgueux. The beef was tender and earthy, the mushrooms almost had the consistency of the foie gras, and I only wish I had been crass enough to ask my server to leave the pitcher of sauce at the table so I could have eaten the rest with a spoon. 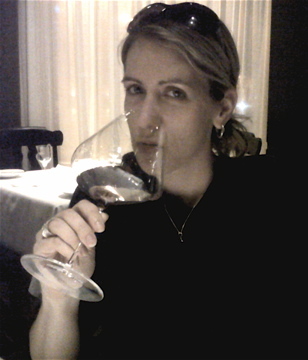 As with most tasting menus, by the time we got to dessert our palates were exhausted. Frankly, I was breathing hard I had eaten so much. 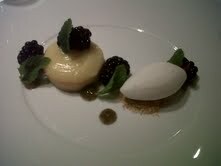 But we pressed on- I had the Lemon Tart with blackberries and yogurt sorbet, which was lovely. However, I wish I’d gotten the Compressed Bartlett Pear, it was lighter and more unique. There was nothing not to like about this dinner, though keep in mind that decadence is usually pricey, and so is Menton. Just pretend you’re Dean Martin, and that you deserve it. ← Frame: I’m a Finalist! Please Vote! Really enjoyed this post – looks delicious (well, except butter soup. That just looks odd).